We all have own kind of style and we have our own opinions on what looks good and what doesn't. But many of us will admit to taking inspiration from well-known celebrities. Here are three of 2018’s most iconic women to discover what their fashion says about them and how you can easily replicate their most famous outfits. As a soon-to-be royal, Meghan Markle is under more pressure than ever to dress the part. Young, stylish and confident, Markle has long been a style icon for women across the world. However, possibly the most interesting aspect of her outfit choices is how they’ve transformed. During the actress’ Suits days, we’d often see her donning high heels, bandeau dresses, skirts with high hemlines, and more daring cuts — such as low v-necks and slit detailing. In 2018, she’s pushed these to the back of the wardrobe in favour of long, belted coats and simple ankle boots to achieve a casual-chic vibe which everyone can pull off. Overall, Markle’s dress sense hasn’t only become more sophisticated and reserved, but it’s also evolved from all-American girl to British fashionista and her style choices seem to hit the fashion headlines almost every day. Gone are the graphic tees and straight leg jeans and in their places are tailored blouses and laced midi dresses that evoke a sense of royal-appropriate sophistication. Then again, when she attended the Invictus Games with Prince Harry, she chose to wear simple jeans with a plain shirt, perhaps showing the world that she can still incorporate dressed-down looks despite her impending title. The important thing to remember is that you don’t have to dress prim and proper 24/7 when you’re emulating the Meghan Markle look. Although her style has certainly matured and reined itself in to a degree, there are still bursts of chic provocation. Her braless, gold-embroidered tulle and silk gown that she wore for her engagement portraits is just one example of her ability to infuse formal events with contemporary fashion. Inject just a touch of the risqué when replicating the Meghan Markle style to keep it interesting. Team shirt-dresses with low heels, off-the-shoulder tops with plain skinny jeans and flats and for the upcoming Spring season you could team a simple blouse with cigarette trousers and a smart but casual looking tailored blazer or long trench coat. Even before Rihanna received the CFDA Fashion Icon Award in 2014, her looks have been a huge part of her celebrity status. Everyone knows Rihanna so the pressure is always on her to pull off new and upcoming styles. The star’s ability to predict and pioneer styles, no matter how revolutionary, has propelled her to the highest echelons of celebrity fashion, which makes her one of the world’s top style icons to emulate for women around the world. Since fashion is evolutionary, it stands to reason that Rihanna’s looks have also transformed since she rose to fame in 2005. Reflecting on Rihanna’s early style, many of her outfits gave the impression of a young, confident, sweet girl — think strappy dresses, rara skirts, crop tops, and boyfriend jeans. We all wanted to pull off her look even way back then. But within a few years, Rihanna edged her style to a more rebellious side, designed to enhance her ‘bad girl’ status. During this period, we saw bralettes paired with hot pants, a more edgy, blunt haircut and who could forget the revealing double denim, skirt-and-jacket outfit made famous by Rihanna’s dismissal of a tee or vest? In time, RiRi morphed her look again — this time, blending her edgy façade with nuances of high-fashion. Enter, the famous naked dress of 2014. Made of nothing but Swarovski crystals and fishnet fabric, the design of this iconic gown was overtly high fashion. Her fashion line, FENTY PUMA, is forcing back the boundaries of standard sports styles and taking athleisure into uncharted territory, creating a high-fashion offshoot of feminine sportswear. 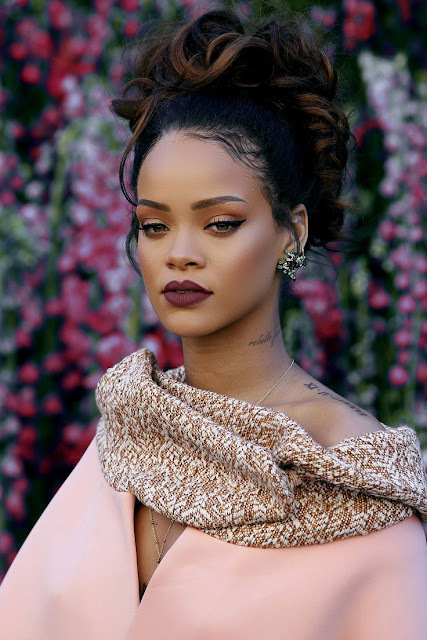 Throughout her style-icon life, Rihanna has always advocated the use of colours and fabrics. Over the years, we’ve seen her in everything from feather-embellished bejewelled bikinis, Swarovski crystals, to silk emerald tracksuits. To replicate it, you need to embody her confidence and sense of adventure. Combine stiletto heels with denim playsuits or tracksuit bottoms, then dress for the evening in something feminine, but outlandish — like the lilac tulle mini dress she wore to Fenty Beauty’s launch party. Rihanna also adores wearing shirts and coats that hang off her shoulders, putting a fresh twist on the cold-shoulder fashion movement. So, incorporate strapless tops and bralettes into your look to ooze the same level of seductive sophistication. Australian actress, Margot Robbie, has experienced a rapid rise in fame and success. In just two years, Robbie went from Neighbours cast member to global film star because of her appearances in films such as The Wolf Of Wall Street, Suicide Squad, The Legend Of Tarzan and more - throwing her talent, character and style into the world’s harshest spotlight. What we find most interesting about Robbie’s look is how, despite some transformations, it has retained a laid-back vibe synonymous with her home country. Robbie blends casual-chic daytime attire with Hollywood-ready evening outfits effortlessly, which means emulating her style opens a world of possibilities. Robbie’s style is feminine, yet eclectic. From sultry lace jumpsuits and conservative high-neck gowns, to girly polka dot dresses and sophisticated belted tapered trousers; the essence of Robbie’s style poses the idea that each occasion has a dress code, and it is up to the individual to infuse it with their preferred style. Let the tone of the event guide your choices, if you want to incorporate Robbie’s style. Sneakers, logo tees and denims give off her signature, laid-back, Aussie-girl vibe when the occasion is low-key, while plain playsuits, kimonos, sandals, and asymmetric skirts reign supreme during dressed-up day events. Robbie is a fan of floral prints and floaty silhouettes like myself, so opt for loose-fit dresses, culotte jumpsuits and embellished gowns. In the evening, Robbie tends to stay true to the accepted standards of glamorous fashion. Ensure you don’t show both legs and arms at the same time and select garments featuring intricate embroidery, classic embellishments or eye-catching metallic finishes. You can channel your inner celebrity diva by incorporating a selection of these stars’ staples fashion pieces into your everyday look!